Air Ministry Unit, Air Attache: Buenos Aires 22nd October 1946 to 16th July 1948 (Record of Service) – Assistant Air Attache. He was awarded a Certificate of ‘Honouris Causa’ (for the sake of Honour) by the Argentinian Authorities. An honoris causa doctorate is an award granted by higher learning institutions to prominent people in a given field or in society in general. Three Horseshoes, High Street Graveley – that opened in the early 20th century possibly rebuilt or greatly extended and with a dodgy ‘S’ sign. A young WAAF Mary Stanley Smith said casually to a friend – I would love to be on that VE Day Flight but Alan Laird Craig doesn’t like WAAF Officers. Some 24 Hrs later this remark was relayed to Alan who telephoned her and said – I understand you would like to come on the Flypast – to which she replied – Oh Yes Please! and he said – Be at RAF Graveley at 5.30 am on the 8th June (1946). She went from Bomber Command HQ to Graveley and arrived there at 05.30 prompt. 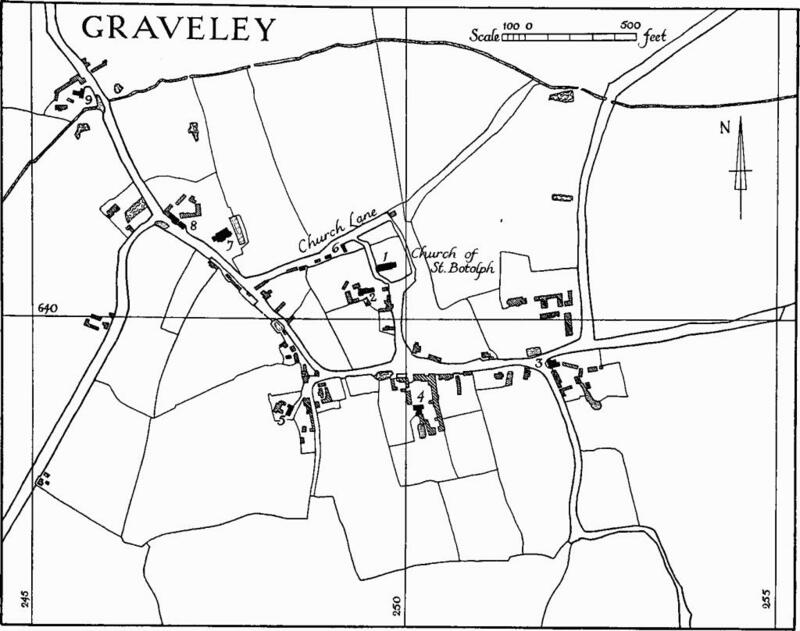 The Squadron flew over London and returned to Graveley and had a very late lunch at the local pub ‘The Three Horseshoes‘ 19-High Street, Graveley, St Neots about a mile from the Base at 3.30pm. While at the Pub someone said to her – Mary! what are you going to do when you leave the WAAF – Before she could answer Alan said – I’ve been posted – she’s going to marry me! Mary said – Norfolk or Suffolk? – No – Buenos Aires as Assistant Air Attache – So…., Will you Marry me? said Alan – Certainly! – said Mary. 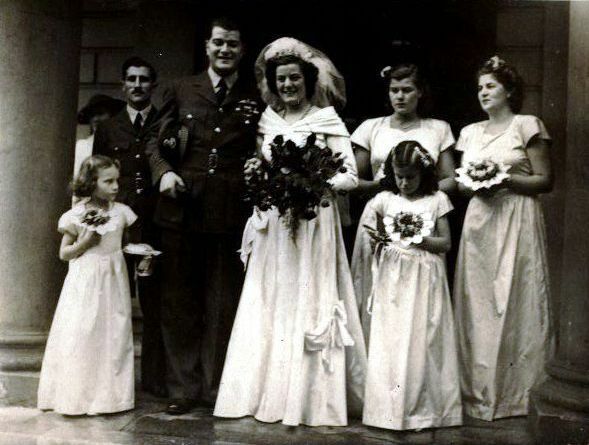 Wing Commander Alan John Laird Craig – marriage to Mary Stanley Smith at St Peter, Vere Street, Mayfair with a reception at the Dorchester Hotel, Park Lane, London. They married in 1946, in the salubrious Mayfair District of London – just prior to his 2 year posting as Assistant Air Attache at the British Embassy in Buenos Aires. Flight Officer Mary Stanley Smith, WAAF, elder daughter of Mr & Mrs E Smith, of High Wycombe, Bucks; and they eventually had 2 sons, 1 daughter. His eldest Son Gavin Ernest Laird Craig was born in an Argentinian Convent Hospital. b.6th August 1947 – Compagnie de Santa Maria, Buenos Aires He could thus now claim his Dual Nationality. Mary as a WAAF was then Personal Assistant to Air Marshal ‘Bomber’ Harris at Bomber Command HQ Naphill and then to Air Marshal Sir Norman Bottomley. Argentina is located in the South-East of South America, bordered in the North by Bolivia & Paraguay, in the South by the confluence of the Atlantic & Pacific Oceans, in the East by the Brazil, Uruguay & the Atlantic Ocean, and in the West by Chile. Buenos Aires is the largest City in Argentina and serves as its Capital & Main Tourist destination. Numbering approximately 37M people, Argentines are mostly descendants of Italian & Spanish immigrants – 92% of the Population profess to be Roman Catholic, and thus makes Catholicism the Country’s most prominent Religion. While Spanish is the major language of Argentina, Italian, German, French, & English are also spoken. An Air Attaché is a Royal Air Force Officer who is part of a Diplomatic Mission; this Post is normally filled by a high-ranking Officer. An Air Attaché typically represents the Chief of his home Air Force in the foreign country where he serves. The day-to-day responsibilities include maintaining contacts between the Host Nation and the Attaché’s Air Force. This includes arranging Official Visits, exchange postings and exercises. Other duties of an Air Attaché also include travelling around the Host country to determine the extent of the Air Force Infrastructure of the Host country and then filing Intelligence Reports with their Superiors in the home Air Force (Sort of Spy). Many of the Travels are disguised as other types of trips, such as Vacations or Family trips, otherwise, the Air Attaché could be expelled for Spying if caught doing so. On a smaller Diplomatic Mission which does not have its own Air Attaché, the role of the Air Attaché is carried out by the Defence Attaché who also deals with Army & Navy matters. Sizeable Diplomatic Missions may be served by both an Air Attaché and an Assistant Air Attaché. Flying in Argentina and Uruguay. Between the wars, Keith Park became Air Attaché in Buenos Aires (while there marrying a London girl – Dorothy, “Dol”) Prior to 1940, he was appointed senior Air Staff Officer to Hugh Dowding where together they built a bond where they had the greatest respect for each other. After WW1 he remained with the RAF, passing through the RAF Staff College, becoming an Air Attaché in Buenos Aires and a Commanding Officer at one of Britain’s peacetime Fighter Stations, before eventually ascending to the rank of Air Vice Marshall. He was also chosen to be one of King George’s VI’s 4 aides-de-camp, riding behind the King in his Coronation Procession in 1937. After WW2 Sir Keith Park was decommissioned and went to Argentina to work as Trade Ambassador to South America for the Hawker Siddley Aircraft Company. An opportunity arose to return to New Zealand as the Company’s Pacific Representative, and in 1948 Park came home to Auckland, eventually retiring and taking a prominent part in the Auckland City Council and other local Body affairs. He died on the 6th February 1975, aged 82. Park married Dorothy (Dol) Margarita Parish (a genuine cockney whose family had strong links with Argentina) in London on 25 November 1918; they were to have 2 sons. Park was one of 20 Officers selected to attend the 1st Course at the world’s 1st Air Force Staff College at Andover, Hampshire, in April 1922. In August 1926, after 3 years in Egypt, he went to the Headquarters of Air Defence of Great Britain at Uxbridge, West London, where plans for the Country’s Air Defence were discussed. “This Map makes clear the Nazi Design,” Roosevelt declaimed, “not only against South America but against the United States as well.” The news of the Map caused a tremendous stir: as a piece of anti-Nazi Propaganda, it could not be bettered. Was the South America Map genuine? It was probably a British Forgery (BSC had a superb document forging facility across the border in Canada). The story of its provenance is just too pat to be wholly believable. Allegedly, only 2 of these Maps were made; one was in Hitler’s keeping, the other with the German Ambassador in Buenos Aires. So how come a German Courier, who was involved in a car crash in Buenos Aires, happened to have a copy on him? Conveniently, this Courier was being followed by a British Agent who in the confusion of the incident somehow managed to snaffle the Map from his bag and it duly made its way to Washington. Embassy located on Dr Luís Agote street in the Recoleta neighbourhood of Buenos Aries. The British Government acquired the Building for use as an Embassy in 1945, which had been built in 1917 as the Residence of Carlos Madero, in an Edwardian style. – from Room 2105 on 21st Floor (top floor) of Serrador Hotel, Rio de Janeiro via Santos Dumont Airport at Guanabara Bay, Rio to Buenos Aries. This Airport was 1st used in 1934 when a 400M runway was built on a landfill area over the Ocean. The runway was extended to 700M in 1936 and eventually 1,350M in the 1940s. A Terminal modelled after the Pan American Seaplane Base & Terminal in Miami was opened in 1937. A new Terminal for Seaplanes opened in 1938 but was shut down when Seaplanes lost their popularity. It is now the Historical & Cultural Institute of the Brazilian Air Force. “The Tudor was built like a Battleship. It was noisy, I had no confidence in its Engines and its Systems were hopeless. The Americans were 50 years ahead of us in Systems Engineering. All the Hydraulics, the Air Conditioning equipment and the recircling fans were crammed together underneath the floor without any thought. There were fuel-burning Heaters that would never work; we had the floorboards up in Flight again & again. This Charicature presumably of someone called Nigel by NZ Cartoonist Alan Reeve (c.1942?) was presented to Alan in Argentina presumably by an Associate – can anyone identify Nigel? AVM Wilfred Ewart Oulton, 1948-1950; Air Attache, Argentina, Uraguay, Paraguay. Awarded to Personnel, and formerly also to Officers of the other Commonwealth Countries, for “an Act or Acts of Valour, Courage or Devotion to Duty whilst Flying, though not in Active Operations against the Enemy”. His Award of the AFC was Gazetted on 1 January 1947 (Gazette No 37835 Supplement to 31 December 1946) and he is given rank as Squadron Leader. The SI is one of Argentina’s most feared & hated State Agencies. Created in 1946 by Argentina’s strongman General Juan Domingo Peron, it was originally a Civilian Intelligence Agency called the Information Division. According to journalist Uki Goni, its 1st task was to arrange the Post-War Transport of Nazi War Criminals to Argentina. Born in Maine in 1910. He graduated from West Point in 1934 and served in the US Air Force. His assignments abroad have included Buenos Aires, Madrid, & Turkey. In 1996 he was interviewed by Charles Stuart Kennedy. DONOVAN: At that time, I was ordered to Argentina as US Air Attaché. Q: Had you spoken Spanish before, or had learned Spanish? Q: Could we talk about Argentina at that time? You were in Argentina from when to when? DONOVAN: The War ended with Japan in 1945, and I went immediately to Argentina. Peron was in an Island Prison on the River, and I think my 1st night there, we were staying in the Alvear Palace Hotel in Buenos Aires, with a cobblestone street right below my window, and about midnight, there was a terrific racket. It was Peron’s arrival, from the Prison, to take over (17th Oct 1945). The Troops, Horses & Wagons, the works, made an impressive entrance on the cobblestones. DONOVAN: He’d been relieved, yes. He had decided to take over. Q: Before you went to Argentina, Argentina, from the eyes of the Allies, played a very dubious role during the War, I think it very grudgingly came in at the very end of the War; its German sympathies were not hidden during the whole War. What were your orders? To go to a hostile place? DONOVAN: I wouldn’t say it was actually hostile, although there were a great many German sympathizers there. As a matter of fact, I’ve reached some of the real night of the World Classics, and when the Germans came by there, they were given receptions and all that, they were treated like conquering heroes and all, but when I arrived there, I met one of the German Groups who owned some very large Cattle Ranches, and they were still 100% German, but they were backing off a bit from the Nazi Type. Before I left, I didn’t see any indications of anything but good faith on the part of the Germans that were there. Q: What was your impression at that time, while you were there, this would be what, ‘45, 48 about, of the Argentine Military? DONOVAN: I think their Military was a pretty strong Outfit. The Army, I’m not sure about the Navy, but their Army was in pretty good shape. Their Air Force was still flying rather antiquated Equipment, it would not have been a very effective Force, in my opinion; but they were, they were all right, I met a lot of them, that and I was in the Air Force myself. I keep saying Air Force, we didn’t become the Air Force until about 1948, it was the Army Air Corps then. Q: Did you find that the Argentine Military was interested in the way we fought our War? We had gone from something like 17th largest Army in the World to about the top of the heap within a few years, were the Argentinians interested in what we had done? DONOVAN: No, I didn’t find anybody that was very interested in that. They were, I imagine that they were really loathing, to not discussing that because they were not in a very good position Militarily. Peron, as you know, had been a Lieutenant Colonel in the Argentine Army. Q: What was your impression of how the Argentine Military felt about Peron? DONOVAN: I think they liked him very much. Of course, the Descamisados were the real power behind it, the ‘Shirtless Ones‘ (Working Class). They really thought the world of him. Evita, she would appear, go to a Factory. I had an American friend who was Head of the Telephone Factory, and she’d come out there and say “I want to talk to the people” unannounced, and she would talk to the people and she’d appear, beautifully dressed, fur coat & everything, and I thought that was rather silly of her to go out there before all these Workers dressed like that, because these were the Poor Workers and everything, but somebody told me that I was wrong, she did that because almost every occasion she’d say “You too could have all of the things I have if you go along with us.” She was a pretty smart gal. Q: Well, during this immediate post-War time, what would an American Air Attaché do in Argentina? DONOVAN: My job there was to get to know all I could about the Argentine Air Force, which I did, and also incidentally, connected with that would be whatever you picked up about the Army & Navy also. We would end, just kept as tight a look on what the Air Force was up to as we possibly could. Report any changes in their makeup, Report anything that, on some of the people in there, what they were doing and if they were good at it or mediocre or what. Just, in general, keep an eye on everything that was going on in the Argentine Air Force. I had an Aeroplane there, an old C-47 (Dakota) that was done up as a Passenger, not as a Freighter, and so I flew around quite a bit in Argentina. Mr James Bruce was our Ambassador most of the time I was there, and he & I visited just about every Army Airbase & Navy Installation in Argentina, so much so that a lot of the people thought that Mr Bruce & Colonel Donovan were wasting their time doing everything with all these Trips, and I reported that to the Ambassador, and he said “Good, let’s keep them thinking that way. Meanwhile, you & I know more Authorities in Argentina and all the Local Governors, Military Commanders, etc. That’s fine, good for us.” He really was a very good man. As can be read in the General Military Aviation History part, the Flying Units were still part of the Army in 1940. The quest for Independence gained momentum in the 40s. A Revolution in 1943 brought a Lieutenant Colonel from the Aviation Branch to Power among others and the formation of the independent Air Force was imminent. Subsequently, Air Force Command was formed on 11th February 1944 and the Secretary of Aeronautics on 4th January 1945. The Air Force also adopted its own Badges & Ranks in the intervening period. Although the structure was in place, much of the necessary infrastructure still needed to be created. Paved runways and both Military & Civil Airfields were introduced and the late 40s and early 50s saw an influx of Modern Aircraft. The Gloster Meteor was the 1st Jet Aircraft adopted in any Latin American Country. They arrived in 1947 and by December of that year the 1st Unit, Regimiento 4 de Caza Interceptora (4th Fighter-Interceptor Regiment) became Operational at Tandil. Other typical Aircraft of that era were Lincoln bombers and DC-3, 4 & DC-6 Transports. Meanwhile, the FMA (Fábrica Militar de Aviones) produced some indigenous Aircraft designs as well, like the Pulqui & Calquin. The Forces were no longer concentrated in the Buenos Aires Province as other Military Aviation Regions were formed from 15th March 1950 onward. These included 6 Brigadas Aéreas (El Palomar, Paraná, Reconquista, Mendoza, Villa Reynolds & Tandil). Moreover, other Commands were formed at Staff level further enhancing the Professionalism of the fledgeling Air Force. Many of these Commands & Brigades are still operational today. Craig flew extensively in Argentina from 1st February 1947 using an Anson X-11 PH617 from El Palomar & Piloting himself between many Destinations. These included Melilla & Maldonado (Uruguay), he ferried Air Chief Marshal Sir Keith Park to Cordoba Instituto & Escuela on 22nd April 1947 and to Melilla on 4th May 1947. Villa Mercedes (Villa Reynolds Airport, San Luis), Rosario (Santa Fe), Salta (Argentine Andes), Tucuman (San Luis), San Juan ( Las Chacritas), a mysterious search in the Andes for Lancastrian Airliner G-AGWH on 16th & 19th July 1947 (before it was reported missing). (Anson Service Ceiling 21,450ft). The Anson MkIII, MkIV & Mk X were all built in Britain by Avro; the former featuring 330 hp L-6MB R-915 engines; the MkIV 300hp Wright Whirlwind R-760-E1 Radials and the latter 335 hp Armstrong Siddeley Cheetah IXs. The Anson Mk X was a MkI with a strengthened Cabin ﬂoor so that it could carry heavy Freight. 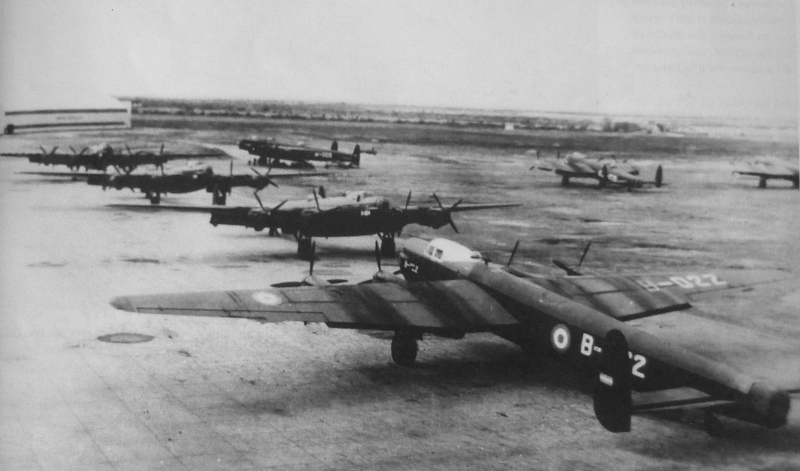 The designations MkVII, VIII & IX were reserved for Canadian variants but never taken up. The 1st Anson MkII, 7069, a MkI converted by Federal Aircraft Ltd made its Maiden Fight on 21st August 1941. This was followed in 1942 by the 1st MkV, serial No.8649X, which was constructed from the major components of RCAF MkI 6013 (ex-RAF N9943). 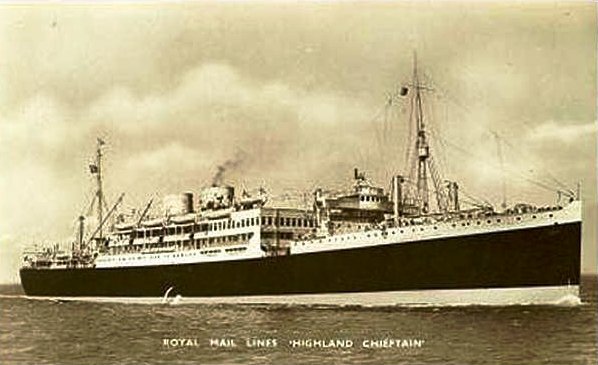 The MkV served the RCAF & the RCN in a number of roles until 1954 when the last 4 in Service were retired; 3 were sold onto the Civilian Market while the 4th, 12518, was preserved. The MkX entered RAF Service from 1943 the majority serving with No.s 24 & 353 Squadrons, 4 & 5 AODU & the ATA; the Type proving to be particularly useful in the Light Freight role, especially to the Continent following the D Day Invasion. 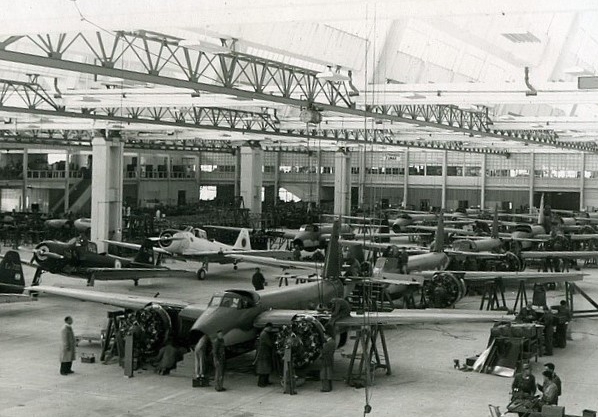 Cordoba (Instituto Aerotécnico) – In 1927, the Military Aircraft Manufacturer (FMA) was inaugurated. The facility would become one of the most important in the world after the WW2 with the arrival of German Technical Personnel. Following Germany’s defeat in WW2, Kurt Tank, the Focke-Wulf Chief Engineer and the Designer of such famous Fighters as the Fw-190, restarted his Professional life in Cordoba in 1947. The City’s Instituto Aerotécnico, (Aerotechnical Institute) had been founded in 1927 and eventually produced over 1,300 Aircraft of 30 different Types. Latterly this was known as the Fábrica Militar de Aviones (FMA) – of the Argentine Air Force (FAA) and many ex Focke-Wulf Personnel joined Tank’s Team along with French Designer Emile Dewoitine & Argentine Engineers Ignacio San Martin & Norberto Morcchio. From 1952, its Production began to diversify, to constitute the Base of the former Institute Aerotécnico, the State-owned Company Aeronautical & Mechanical Industries of the State (IAME). Córdoba was chosen as the Site of The Instituto Aerotécnico that later became the Fábrica Militar de Aviones. It employed the Focke Wulf men. El Palomar Airport (IATA: EPA, ICAO: SADP), is a Military Airport in El Palomar, Argentina. It is the home base of Argentine Air Force 1st Air Brigade (Spanish: Primera Brigada Aérea), located 18 km (11 miles) west of Buenos Aires, near the El Palomar Station of the San Martín Railway Line. El Palomar in the Campo de Mayo Military Area was adopted as the home base of Military Aviation. The early days saw a big influence from the Aeroclub, especially engineers Alberto Mascias & Jorge Newbery because the Government simply lacked knowledge, funds & equipment. In honour of their achievements, they were granted Military Aviator Status before the 1st Class of Officers Graduated. Jorge Newbery sadly died in a plane crash 1st March 1914, the Aeroparque Airport of Buenos Aires is named after him. Involvement of the Civil Aeroclub in Military Aviation School ended in 1915 when the Military was sufficiently trained to organise Flight Instruction & Air Operations renaming the School in Escuela Militar de Aviación in the process. The name reverted to Escuela de Aviación Militar again in 1944 and it is still known by that name today. Alan’s Searched for BSAA’s Lancastrian Star Dust from here 16th & 19th July 1946 yet the Aircraft was not yet reported as missing or even taken off. The Base became Operational as Base Aérea Militar Villa Mercedes on 8th October 1938 and was renamed Base Aérea Militar Coronel Pringles on 22nd Movember 1939. V Brigada Aérea was Based here. Runway data: Rwy 06/24, Size: 2360 x 50 m (7743 x 164 ft), Elev: 485 m (1591 ft). Runway data: Rwy 10/28, Size: 2400 x 45 m (7874 x 148 ft), Elev: 485 m (1591 ft). Squad of I.Ae. 24 “Calquín” Fighter-bombers at the “Coronel Pringles” Military Air Base, Villa Mercedes, San Luis. Late 40’s Also known as the “Argentine Mosquito” due the similarity to the de Havilland Design. Three years later the Group was reorganised, adding Personnel & Material coming from The Tamarindos Base in Mendoza, and adopting the name of “Military Airbase General Urquiza.” In 1930 other Buildings were raised to serve as accommodation for Staff who hitherto lived in the City of Parana. Three years later were completed the asphalt roads which linked the Base with the City, fostering greater integration between the 2. The impact of base’s activities was large in the daily life of the City, which begins to receive many people from surrounding provinces mainly due to the new jobs generated. Finally, on March 15th, 1949, with the creation of the Ministry of Aeronautics, arrives independence of the Air Force and the Base acquires its present name as “2nd Air Brigade, Parana.” Since then, in the Base also is located the Justo José de Urquiza airport covering only domestic flights to Buenos Aires and other Provinces in the Republic. Airport and military base share the same facilities. 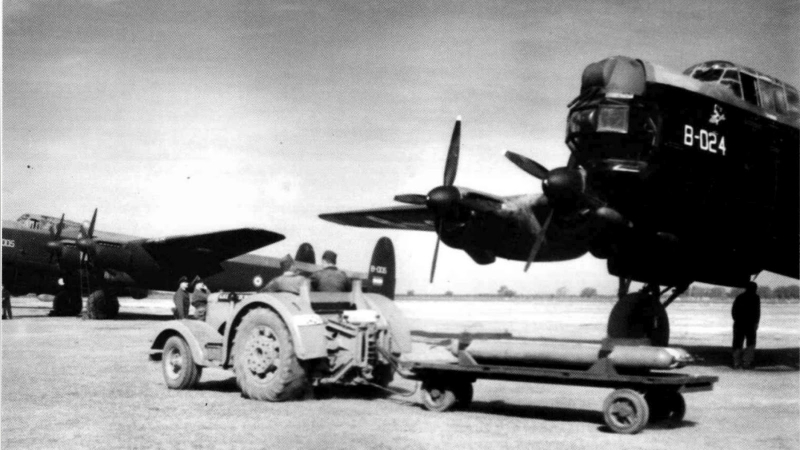 Avro Lincoln MK II squad of the I Bombardment Regiment, Argentine Air Force. Villa Reynolds, San Luis, Argentina., 1949. Avro Lancaster Squadron belonging to the I Group of the Command of Strategic Bombing, Argentine Air Force. Villa Reynolds, San Luis, Argentina 1948. 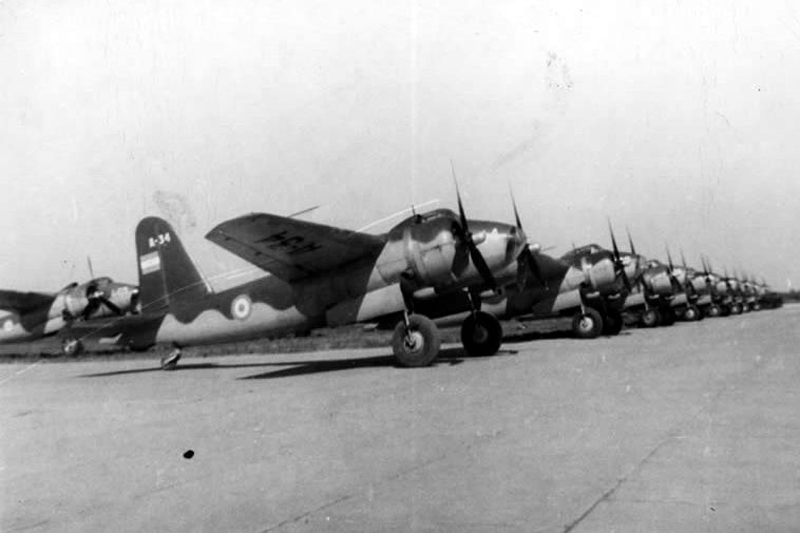 HBM Air Attache Squadron Leader, K Biesiegel took some Officers in Anson PH617 to Base Aérea Militar Pringles when an RAF Mosquito visited Buenos Aires during 1946.